♥ 100th Anniversary – America and World War I the centennial celebrations of America’s entry to WWI provides a great opportunity to discover the main American battlefields. The United States formally entered World War I on April 6th, 1917. By the time the war finally ended, on November 11, 1918, more than 2 million American soldiers had served on the battlefields of Western Europe, and some 50,000 of them had lost their lives. Your Licensed English Speaking Guide will pick you up from your hotel in Paris at 8.00 am in a deluxe private vehicle and you will depart immediately to the Pays de Meaux, just an hour east side of Paris. Enjoy a quick stop half‐way for coffee and croissants. Upon your arrival, you will be given an introduction by your private guide to the Great War. You will begin your day with the visit of the famous museum of the Great War built in 2011 where you will you will have the opportunity to view remarkable films and documentaries about the Great War. Housing a collection unparalleled anywhere in Europe, the Musée de la Grande Guerre in Pays de Meaux offers a new vision of the first worldwide conflict, through innovative scenography illustrating the great changes and upheavals in society that resulted from it. Your guide will explain to you how the US entered the war. After a 40 minutes drive, you will arrive in the town of Château Thierry which to this day remains strongly connected to the presence of the American armed forces in WWI. Château-Thierry, where American soldier footsteps turned in 1918, is indelibly written into the pages of American World War I military history. The town is remembered for the struggle of May-July 1918, when the splendid defense of the French and American armies barred the road to Paris. 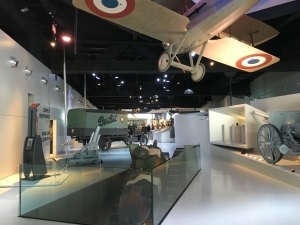 You will see the house of Franco-American Friendship and you will learn about the life of Teddy Roosevelt‘s son, Quentin, who was shot down near Château-Thierry in July 1918 while flying a French SPAD plane. Following this, you will have a lunch in a traditional restaurant in the heart of the historical town. Bon appétit ! After this delicious lunch, you will reach one of the highlights of the day ! 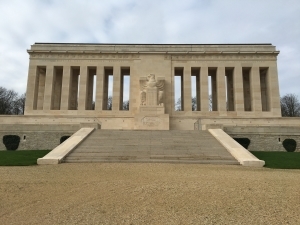 Located on the « Hill 204″ above Château Thierry, you will stop at the American Monument and you will enjoy the panoramic view of the Marne valley countryside. The Chateau-Thierry Monument commemorates the sacrifices and achievements of American and French fighting men before and during the Aisne-Marne and Oise-Aisne offensives. Following this, you will relive the attack by the Marines on « hill 142 ». The Battle of Belleau Wood (1-26 June 1918) occurred during the German 1918 Spring Offensive in World War I. It became the scene of fierce combat where many of those buried in the cemetery lost their lives. Your guide will invite you for a walk to discover the Marine Monument. It commemorates the 4th Marine Brigade of the U.S 2nd Division, which was primarily responsible for the capture of the wood. 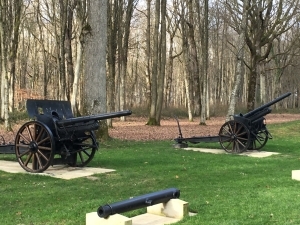 Cannons, vestiges of trenches and shell holes still remain in Belleau Wood !!! After this, it is now time to discover the famous American Cemetery. 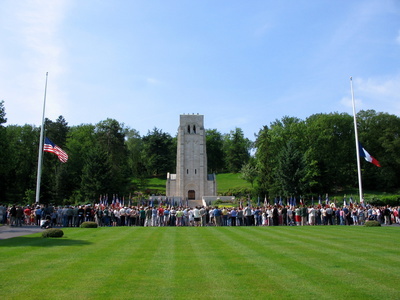 The Aisne Marne Cemetery lies below the hill containing Belleau Wood and it is one of 8 permanent American World War I military cemeteries outside the US. This 42,5 acre cemetery contains the graves of 2289 american soldiers, most of whom fought in the vicinity and in the Marne valley in the summer of 1918. During your private visit, your guide will show you famous headstones with the appropriate explanations, the Memorial Chapel and the Wall of the Missing where the names of 1060 soldiers are engraved on the wall. After this emotional walk through the cemetery, you will return to Paris in the late afternoon where you will be dropped off at your hotel.